As a young Christian, I was raised on “dispensationalism”, a term which comes from the Bible referring to God’s timing and how He works differently at different times. We had it all figured out, just like the Jews of Jesus’ day. (But wait, they missed it! Are we?) According to what is known in theological circles as “pre-tribulational, post-Apostolic, literal Israel dispensationalism”, evil will increase until the end of the age when a seven year “great tribulation” will occur where a man possessed by Satan and known as the anti-Christ will come to power. According to this view, before this time, Christians will be secretly raptured up to heaven and escape this time of tribulation. The “Left Behind” series is based upon this scenario. According to the “literal Israel dispensation” view, the Jews in Israel will reestablish temple worship and sacrifices in a rebuilt temple in accordance with a pact with the anti-Christ who will break that pact after three and one-half years. In the “Left Behind” scenario, many people, including many Jews, will turn to Christ during this great tribulation and suffer great persecution including martyrdom. Strangely, those who advocate this view teach that the restraining influence of the Holy Spirit, in-dwelling believers, is what presently prevents the anti-Christ of Revelation from coming to power and that the Holy Spirit’s ministry through believers will leave this world at the rapture. But, the Bible teaches that it is the Holy Spirit who leads people to Christ. The obvious question arises: how will Jews be drawn to Christ during the tribulation if the Holy Spirit is absent? Theologians who subscribe to this view interpret the Book of Revelation as a chronological account of the great tribulation. They see the Church age or age of grace since Calvary as the times of Gentiles. They believe that the Old Testament is the account of God’s dealings with the Jews, but believe that this dispensation is yet unfinished, and that a seven year tribulation remains for the Jews. This dispensational view is a relatively new doctrine. Its earliest roots can be traced to post reformation Catholic theologians who developed this theology in order to oppose the teaching of the reformers, including Luther, Calvin and Knox, who associated the institution of the papacy with the anti-Christ of scripture. Dispensational doctrine did not gain acceptance among Protestants until after 1830 as a result of a prophecy by a woman named Margaret McDonald who spoke of a secret coming of Christ for His church before the tribulation. The doctrine was spread by Charles Darby [Plymouth Brethren] and popularized by Scofield. Acts 8 records a “great persecution”. 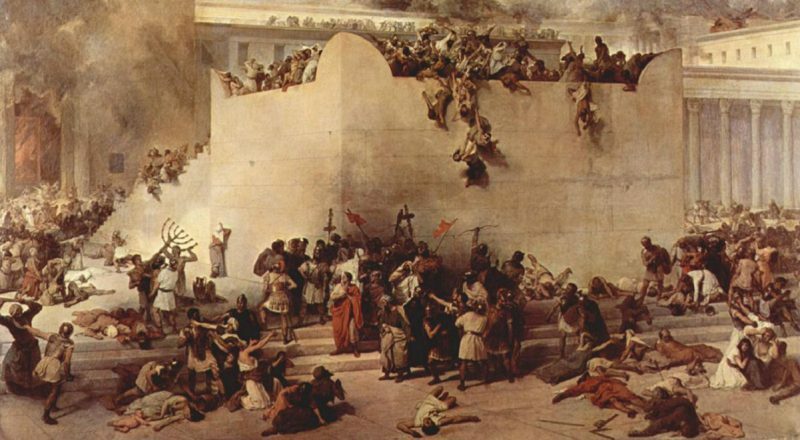 Acts 22:19 says that Paul and his followers were “imprisoned and beat in every synagogue”. How about the gospel being preached to all nations? Acts 2 records that people from every nation under heaven were present at Pentecost when Peter preached the gospel in 33 AD. Colossians 1:23 says that the gospel has been preached to every creature. It was probably written before 70 AD. Jesus next told His hearers that when they saw these signs they were to flee. Did anyone escape the destruction of Jerusalem? Yes, before the city was destroyed, every Christian fled and escaped. Of course, they would have been the ones to have heard and passed on Jesus’ warning. And they knew what He was referring to. Josephus chronicles the great tribulation that occurred in Judea and Jerusalem prior to the destruction of Jerusalem. Even though Christians had survived, they could have been destroyed by famine had not the days been shortened. We need to be careful not to be deceived about some secret coming of Christ. We should not be fixed on a preconceived idea of the future and Christ’s return; no one knows the day when He will return, but we should be prepared at all times. There is not one verse in the entire New Testament that mentions a seven year tribulation. We should not be deceived to think that we will never go through persecution or tribulation, great or small. We need to prepare our hearts that we might be faithful regardless of what cup God gives us to drink We can take great faith that Christ can miraculously deliver us or empower us to go through any persecution or tribulation. We’ll know it’s Him because we know Him and His word [we’ll meet Him in the air] not because he fulfills a predetermined set of circumstances. Jesus spoke of the “Great Tribulation” in the Olivet discourse and He referenced Daniel the prophet. Many have correctly interpreted this tribulation to be a fulfillment of another prophecy by Jeremiah of a time known as “Jacob’s trouble” in which the people of Jacob (Jews?) would experience great tribulation. In Daniel chapter 9 we have the record of an interpretation of a vision that Daniel received. He is told that the vision applies to “his people.” Obviously, that would be the Jews. But, if this time of great tribulation that Jesus was speaking of is for Jews, when did it or will it occur? That is the key question. Is the Great Tribulation for the future, or is it fulfilled or is it continually unfolding even now? We must understand that one of the major rules of biblical interpretation is that the New Testament interprets the Old. So if the New Testament explains what Jesus meant when He used the term “abomination of desolation,” then that has to be the meaning of the term in Daniel. In Luke 21:20 Jesus makes it clear that the abomination is pagan armies surrounding Jerusalem. Jesus was answering questions about the destruction of Jerusalem. It is clear that what was to become a desolation was Jerusalem. All Christian theologians/historians agree that the first 69 weeks of Daniel’s prophecy were fulfilled up to the time of Christ. Dispensationalists put a 2000-year gap between the 69th and the 70th week. But, grammatically, the passage refers to a single unified period of time. Daniel 9:24-27 is a prophecy about Christ, not the anti-Christ. Jerusalem was restored. The streets were rebuilt in troubled times, the resistance mentioned by Ezra and Nehemiah. The Most Holy was anointed. The Most Holy is Jesus. “The Spirit of the Lord is on me, because he has anointed me to preach good news to the poor.” (Luke 4:18) Dispensationalists say this refers to anointing of a future temple. Only God can anoint something as holy. God will not anoint a new temple for carnal sacrifice in conflict with the finished work of Christ. An end of transgressions was made. Jesus cried, “it is finished.” It was finished at Calvary. Jesus came to save from sin. He is the Lamb of God who takes away the sin of the world. He made an end of sins. He made reconciliation for iniquity. He brought in everlasting righteousness. The canon of scripture has been closed and Christ has fulfilled prophecy. The sealing up of vision and prophecy refers to Jesus fulfilling scripture. Daniel 9:26 records that Messiah would be cut off after 69 weeks. That means He had to be killed in the 70th week. In fact, He was crucified after a three and one-half year ministry, or in the middle of a seven-year period. Daniel says, “He shall confirm the covenant with many for one week.” Dispensationalists say that “he” refers to the anti-Christ. The prophecy never mentions or refers to the anti-Christ. Grammatically, the pronoun “he” in v 27 must refer to Messiah. The scripture doesn’t say he made a covenant of seven-year duration, but that He would confirm it with Israel for 7 years. It doesn’t say that he would make a new covenant, as dispensationalists argue, but that He would “confirm the covenant”, referring to the everlasting covenant. Jesus confirmed the covenant through His sacrifice. He even said that His ministry was first directed to Daniel’s people. The word “confirm” could also be interpreted “prevailed with”; Jesus prevailed with Daniel’s people for three and one-half years. The Apostles, as Christ’s representatives, continued to preach to the Jews for the remaining three and one-half years. Luke 21 makes it clear that the “abomination that causes desolation” is Roman armies surrounding Jerusalem. The Lord’s prophecy of Jerusalem’s destruction is fulfilled! The tribulation of those days was indeed great. Over two million Jews killed. The “great tribulation” of those days was cut short as the Lord promised that it would be. The classical, most prevalent, teaching of the church has been that believers will endure a time of tribulation when the anti-Christ persecutes the church. Nowhere in scripture is there given a seven year time period for this persecution. At the end of this time, Christ will return to rule on earth. As He returns, the dead in Christ will be raised first and then those of us who remain will be transformed and we shall all meet Him in the air. We shall immediately descend to earth with Him to conquer His enemies and rule for a thousand years. Scofield also popularized the doctrine of a separate Apostolic dispensation which ended when the original Apostles died and after which the charismatic gifts of the Holy Spirit (as enumerated in 1Corinthians 12) ceased to function. This doctrine of ceasationism lacks any serious biblical justification and is refuted by church history to the present day. Curiously, in this day, even Pentecostals and charismatics have embraced Scofield’s pre-tribulation theology. Scofield and the dispensationalists see the tribulation as a fulfillment of Dan 9:24-27 with a 2,000 year gap between the 69th and 70th week. According to them, Jesus has a bride which is the church and then a separate relationship with the Jews. But the Bible says that Jesus has removed the dividing wall, that in Christ there is neither Jew nor Gentile, but rather one new man (Colossians 3:10-11). One of the dangers of this dispensational view is that we indulge ourselves in escapism. This theology is really only popular in America, where escaping from problems is a way of life. How will people who have been indoctrinated into this theology respond if they are faced with persecution? Will they lose faith? There is also a danger of losing our focus on the great commission and preparing the earth to receive her King. If our focus is on how we are going to escape tribulation, we may ignore the call to evangelism, especially if it becomes costly. If the pre-tribulation rapture doesn’t pan out it could set people up for disappointment. Many might fall away in disillusionment. The Bible warns of such an occurrence at the end of the age, before Christ’s return: “Let no man deceive you by any means: for that day shall not come, except there come a falling away first, and that man of sin be revealed, the son of perdition;” (2Thess. 2:2-3). The scripture is referring to the day of Christ’s return and Paul is writing to tell them that they haven’t missed it. Jesus promised that in this life we would endure tribulation. This age is the tribulation! The scripture is certain that the day of Christ’s coming will not occur until we see the “man of sin”. Paul clearly said that the anti-Christ would come before the resurrection and Christ’s return. Christians in this country are being massively deceived! They are being led to believe that they will be secretly raptured away before tribulation. What happens when they are disappointed? Then we shall see the massive falling away that the Bible warns of! We shouldn’t attempt to put God in a box of our own making. We could end up disappointed like the Jews of Jesus’ day. I believe that this pre-tribulation rapture theory is the biggest mass deception foisted upon believers in all of history! The Bible never teaches any “secret” coming of Jesus for His people who happen to be Gentiles while the other part of His bride must endure tribulation. Jesus is not a polygamist. There will be no wedding feast until the whole Bride is in attendance. Jesus warned us not to believe anyone who proclaimed His coming in secret. Just the reverse, the scripture is very clear that at His second coming, “every eye shall see Him”. We shall all face Him in judgement.